To start using the Advanced Output, select the Output > Advanced menu option. You will see a window that lists the active screens on your computer down the left hand side. Each screen represents an output going out of Resolume. To setup a screen, right click on it on the left hand side. You will see a dropdown of all outputs that are connected to your computer. You can choose which output this screen should use. This way you can very quickly assign the correct screen to the correct output when working with multiple outputs. The screen will show the output it's sending to under its name, as well as in the Device dropdown menu on the right. You can also change the name of a screen by double clicking on it. Any monitors or projectors connected to your computer are automatically available as output for screens. Resolume will show the name and resolution of this connection. Keep in mind! Resolume itself does not create outputs. This is handled by your computer. So if you have a screen connected to your computer, but it doesn't appear here, you will first need to make sure your computer recognises it correctly. Check if it's set to proper extended desktop mode (PC) and the arrangement is not set to mirrored (Mac). You can read all about setting up extended displays in the chapter on setting up outputs. Every output can only have a single screen associated with it. The poor projector would otherwise get very confused when you try to send it two whole frames of pixels on every frame. When you select an output already in use by another screen, Resolume will set the output of the other screen back to virtual. Tip! If you accidentally select the main monitor as your output, the output will fill the main monitor and you won't be able to access the interface anymore. Don't worry! Just hit CTRL-SHIFT-D ( CMD-SHIFT-D on Mac ) to disable all outputs and get the interface back. Any connected cards that support playback will show up here as well. Depending on the card, this will display various extra options that will let you select things like which port and what video format to use. Tip! For fluent playback, choose a Video Format where the update frequency matches both your content's fps, your composition's fps and your display's refresh rate. Outputting at 50i will not give good results when your monitor is refreshing at 60Hz, your content is 30 fps and your composition is rendering at 60 fps. Even when you're in Europe. Also cards that have both an input and an output can be used for output. Keep in mind that not all cards support full duplex. Full duplex is a fancy word for simultaneous input and output. 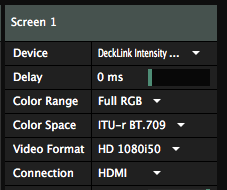 Output via playback cards is only available in Resolume Arena. It has support for playback via Blackmagic, Datapath and AJA products. Syphon (Mac) and Spout (PC) are protocols for texture sharing between applications. They will let the output of one application magically appear as an input in another application running on the same computer. After you have set a screen to output either via Spout or Syhpon, any Spout or Syhpon enabled applications will pick up Resolume as a sender. Resolume will use the name you give the screen as the Server Name / Sender Name. By default this would be 'Screen 1'. You can change it to whatever you like. I would go with 'Charlie Screen'. This screen has one speed: Go! Resolume will use either 'Avenue' or 'Arena' as the application name. You can change the width and height of the screen to change the resolution of the texture you want to share. Similar to Syphon/Spout, NewTek NDI will let your share your output with other applications that support the NDI protocol. The added advantage is that NDI works with multiple computers connected to the same network. You can use this to send a single output from VJ laptop to a master server computer, which is used to scale and position the output to the pixelmap. When enabling NDI output, Resolume automatically announces itself on the network. Other NDI enabled applications will pick it up automatically. 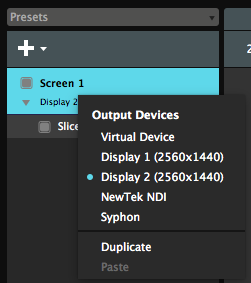 Virtual Outputs are sort of an internal Syphon/Spout, just for Resolume. Screens set to virtual outputs can be picked as input for slices in other screens. This allows all sorts of complex scaling and routing possibilities, with a minimal performance hit. You can change the output resolution of a Virtual Output by changing its width and height. Each screen has Opacity, Brightness and Contrast controls, as well as individual controls for the Red, Green and Blue channels. You can use these to adjust mismatched outputs. For instance, you can dim the brightness on a LED panel while sending the undimmed output to a projector as well. Or you can remove some red from a projector when it doesn't match the other projectors you are using. 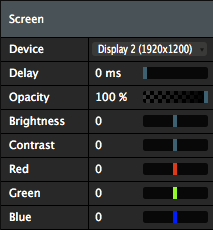 Each screen can have a delay between 0 and 100 ms, to account for small delays introduced by the signal chain after the outputs leave Resolume. You can temporarily turn a screen off and on by clicking the toggle in front of it. This will enable or disable all output to that screen. This is very useful when identifying which screen is which during troubleshooting or to temporarily disable a single screen during performance. You can also fold and unfold a screen by clicking the arrow beneath it. This will keep the output going, while hiding all the slices contained in the screen. This is useful to prevent slices from getting in the way when working with lots of screens and slices. You can prepare your screens without having them physically connected. This is useful when you need to prepare for a show before the venue is open. When you open the Advanced Output without having any secondary screens connected, it will open with a single Virtual Screen. You can set the resolution of this Virtual Screen using the Width and Height parameters on the right hand side. By matching these settings to the resolution that your output will have during show, you can prepare your setup beforehand. Then, once you are connected to the actual output, you can tell your screen to use that output instead, via the right-click dropdown. You can create as many Virtual Screens as you need via the Plus+ menu.